Not much to see here, guys. Just THE BEST CHICKEN SANDWICH EVER. Should we keep talking? You guys, these sandwiches are the stuff of legends. I mean, I cannot count the number of group texts that have gone back and forth dissecting every last crumb and flavor of this sandwich. People have their opinions about chicken sandwiches, I know, and admittedly I don’t have Southern roots or anything so I … kind of don’t know what I’m doing. Except I do know what I think tastes good, and I think these are amazing. I started with a brioche bun – just the right amount of fluffy lightness, and I spread them with butter and toasted them in the oven so they had a little structure to them. Then on went the fried chicken, the bacon, the Swiss cheese. I love the crunch and tang of slaw, so I piled it on high. The crown jewel was a few pickle slices (mine were spicy/sweet) and a heavy handed shmear of honey dijonnaise. If you’re feeling like this is something you need to eat right now, then you’re understanding. frying to golden brown juicy chicken perfection. With a reasonable amount of common sense, you won’t burn anything and you won’t get oil splattering all over. You’ll just do the 1-2-3 fried chicken dance (soak, dredge, fry) and people will rave about your chicken sandwiches for literally years. See, that wasn’t so scary. After you fry your chicken, you’re pretty much done, and the ball is in your court. Slaw – yes/no? Mayo/no mayo? I believe in mayo slaws, so I vote that direction. Cheese? I like Swiss, but if you want to take a spicy angle, Pepperjack is also an excellent choice. Bacon? I don’t know, I guess it depends on how much you love yourself. Buns – going all-out with a biscuit? I like the lightness of brioche, but you do you. Sweet sauce? or spicy? Honey dijonnaise is what’s written into this recipe, but spicy mayo won’t disappoint. This is your fried chicken sandwich masterpiece. FRY: Heat the peanut oil in a frying pan until a speck of oil sizzles across the top. Using tongs, shake excess liquid off the chicken pieces. Coat each piece in the dry flour mix. Add to the hot oil. Fry for 5 minutes on one side, then 2-3 minutes on the other side until golden brown and crispy. Drain on a paper towel lined plate and sprinkle with a little more salt (to taste). Honey Dijonnaise: 1 cup mayo, 2 tablespoons honey, 2 tablespoons dijon mustard. Season / adjust to taste. One last note – this was the most fun dinner club recipe ever, because we did a Southern theme with mac and cheese, and collards, and fried green tomatoes, and bourbon sweet tea, and crack pie, and it was just the best. And I have this recipe from Bread Babe to thank for helping me learn how to do the fried chicken sandwich thing! 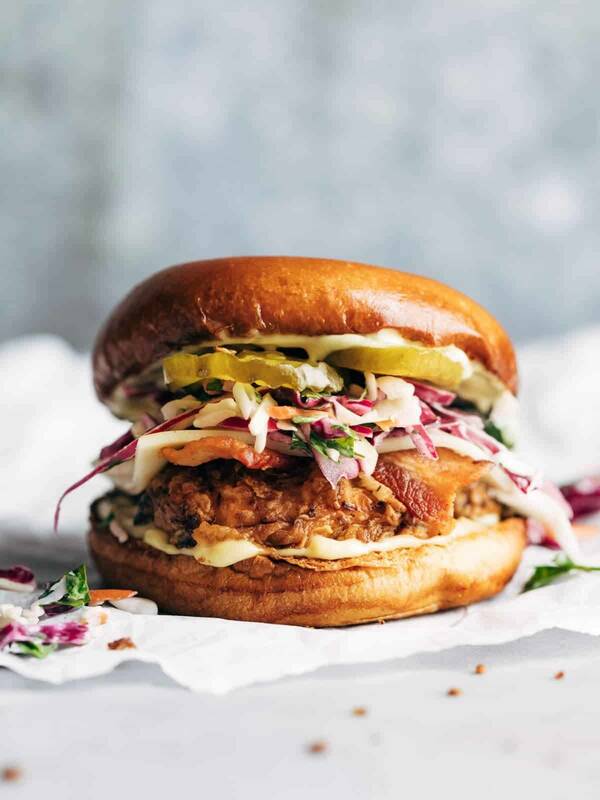 The post Summertime Fried Chicken Sandwiches with Tangy Slaw appeared first on Pinch of Yum.